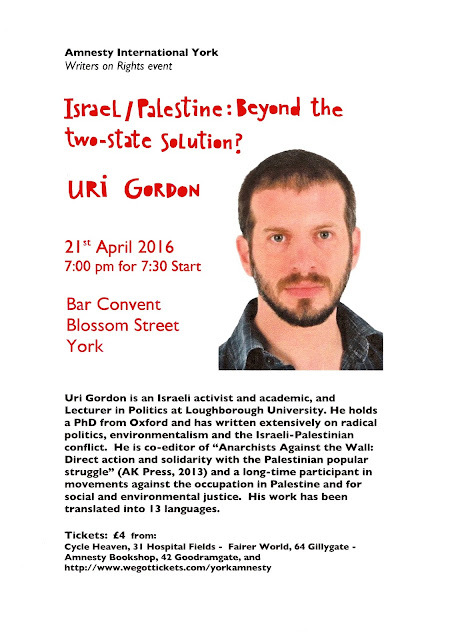 Amnesty International York: Israel/Palestine: Beyond the two-state solution? Israel/Palestine: Beyond the two-state solution? Our next monthly meeting takes place at the usual venue (York Friends Meeting House on Friargate) on Tuesday 12 April at 7.00pm. We have a speaker, John Bourton from Veterans for Peace. John lives in York and has been a member of VFP UK since 2011. He was in the Army for 19 years. He is currently chair of the VFP UK Steering Group. Veterans For Peace UK is a voluntary ex-services organisation of men and women who collectively have served in every war that Britain has fought since WW2. Educate young people on the true nature of military service and war. Resist war and militarism through non-violent action. Stand in solidarity with people resisting militarism and war. They hope to convince people that war is not the solution to the problems of the 21st century. John’s talk will cover the current activities of VFP UK and his own personal experiences which led him from professional soldier to peace activist. He may also mention the law regarding current conscientious objectors in the ‘volunteer’ army. Please feel free to come for the talk alone or to stay on for the business meeting. Everyone is welcome to attend.